McMinn 10th April 2019. Peacefully at hospital, Mervyn, late of 15 Kilnaslee Road, Pomeroy, Dungannon, dear brother of Margaret (Turner), Gordon, Helen (McKee) and the late Robert John, Ella (Brown) and Noeline and much loved uncle. Family and friends welcome at 7 Kilnaslee Road, Pomeroy, Dungannon where his funeral will be from on Friday 12th April 2019 at 1.00 p.m. to Castlecaulfield Presbyterian Church for service at 2.00 p.m., followed by interment in the adjoining churchyard. 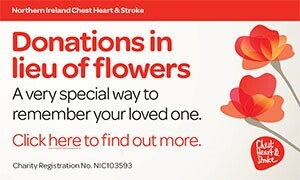 Family flowers only, donations in lieu if desired are payable to Corkhill Care Centre Residents Comforts Fund c/o F. Martin & Sons, Funeral Directors, 185 Ballygawley Road, Dungannon BT70 1RY. Very deeply regretted by his sorrowing family and family circle. I am sorry to tell you that Mervyn McMINN has passed away.